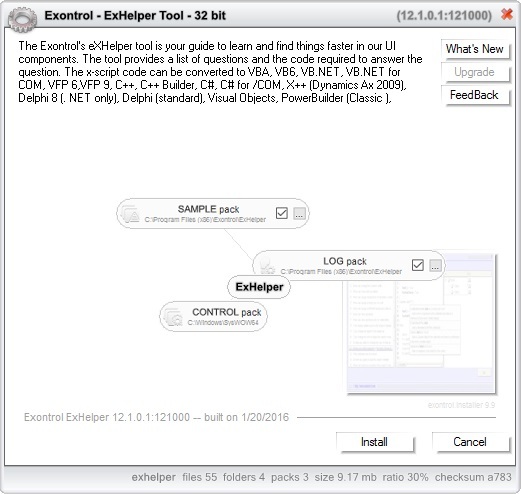 The Exontrol's eXHelper tool helps you to find easy and quickly the answers and the source code for your questions regarding the usage of our UI components. 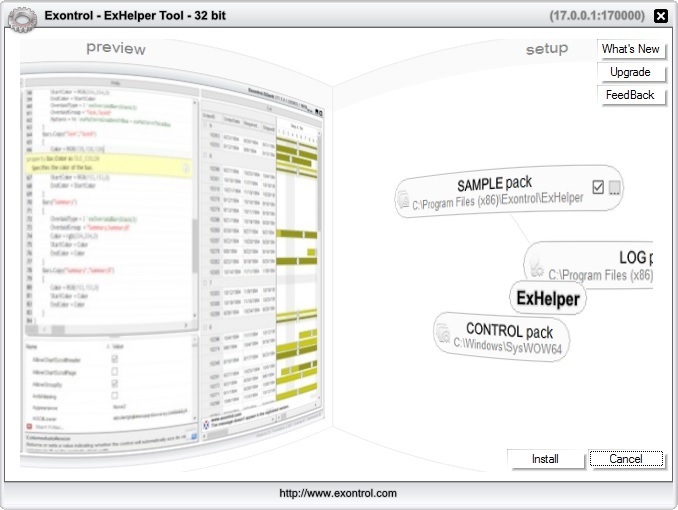 The Exontrol's eXHelper tool helps you to find easy and quickly the answers and the source code for your questions regarding the usage of our UI components. 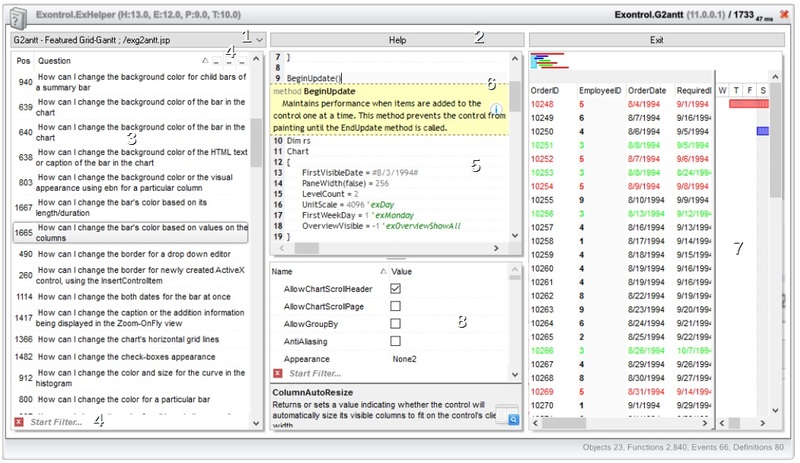 The exontrol's eXHelper tool divides its client area in three parts: Questions, Template and Running panels. 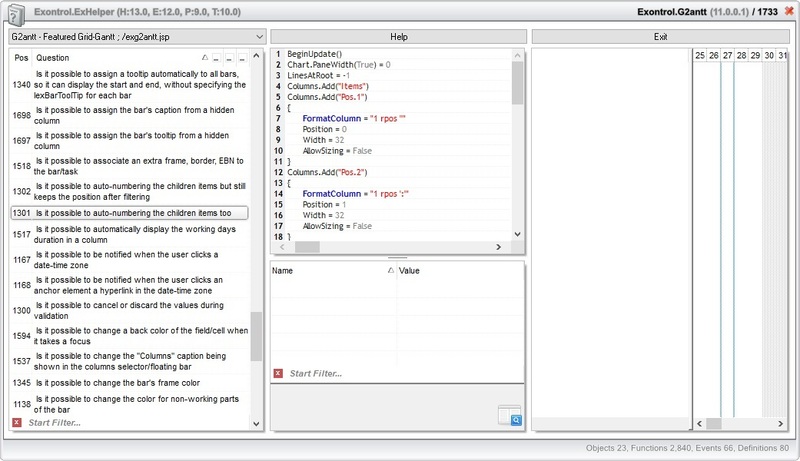 The Questions panel shows a list of questions, where you can search of filter your keywords, Once you press ENTER or double click the question, the Template panel shows the code required, and the Running panel shows the component, and runs the template. Each question provides the x-script code to answer the question The Template section is editable, so you can type or insert your own x-script code. 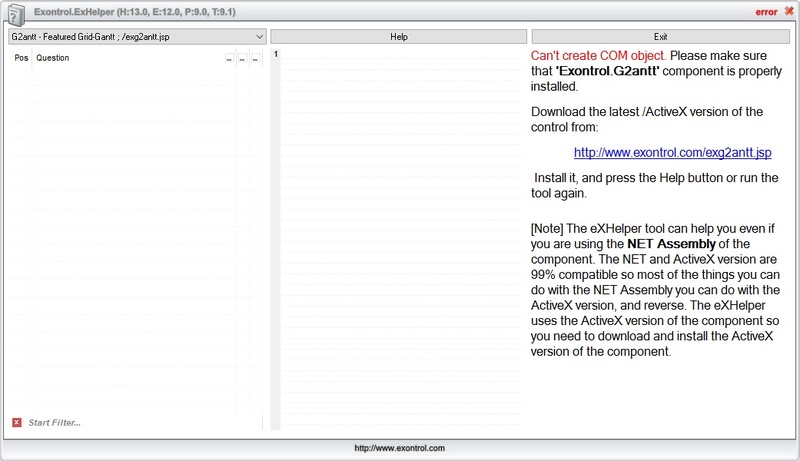 The following screen shot shows how to use the eXHelper( 8.X ). The sample looks for the question "How to magnify a specified date and apply a different background color?" Click here to show how to use the eXHelper 6.X. and prior versions. Click the Install button, and the tool and required components are installed on your computer. By default, the installer opens the folder where the ExHelper.exe tool is installed. Lets say that you are asking: "Does your tree control supports partial - check feature?" Select the G2antt - Featured Grid-Gantt, in the drop down list box, so we can get the questions for the eXG2antt component. Type the partial word, so the column gets filtered only questions related to the partial keyword. As you start typing, the control will look progressively for the questions that contains parti... characters and so on. The Template panel lists the properties and methods, the code required to answer the question. Drag the cursor over any property or method in the Template panel, and its documentation shows up. Click the Running Panel, and see how the control reacts as the Template script was applied. Shows the Properties of the browsed control. Changing a property in the browser, will add/remove the code in the Template panel (7). The documentation is just a plain TXT file, that contains x-script code, that's retrieved from our server. 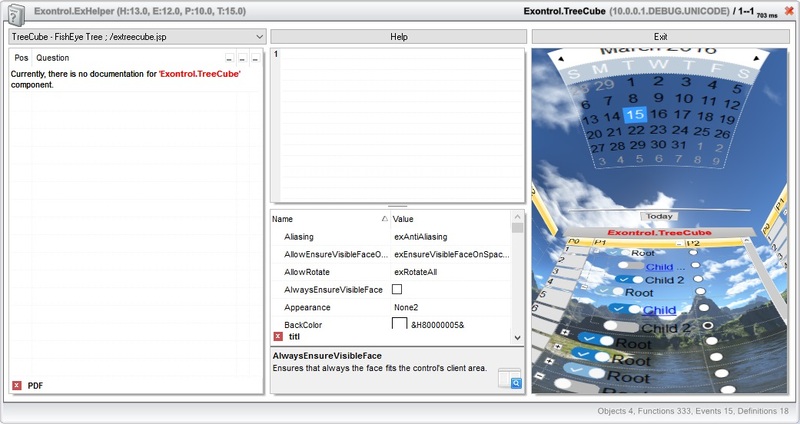 For instance, remove the exontrol_tree.txt from ExHelper folder, and run the tool again. You will be asked to get it automatically from our web server. We would recommend you from time to time, to refresh your control documentation, even by removing its respective TXT file, or by clicking the Help button while SHIFT key is pressed. The eXHelper is free to use for anyone that wants to start working with any of our UI component. Select a question in the left side panel, the one that lists the frequently questions ( 3 ), and next double click the question or press ENTER key. The x-script code is shown in the middle panel (5). In the same time, the horizontal scroll bar in the middle part ( 5 ) includes the following a ... button. Click it, and the submenu lists all programming languages you can convert x-script too. Select a question in the left side panel, the one that lists the frequently questions ( 3 ), and next double click the question or press ENTER key. The x-script code is shown in the middle panel (5). 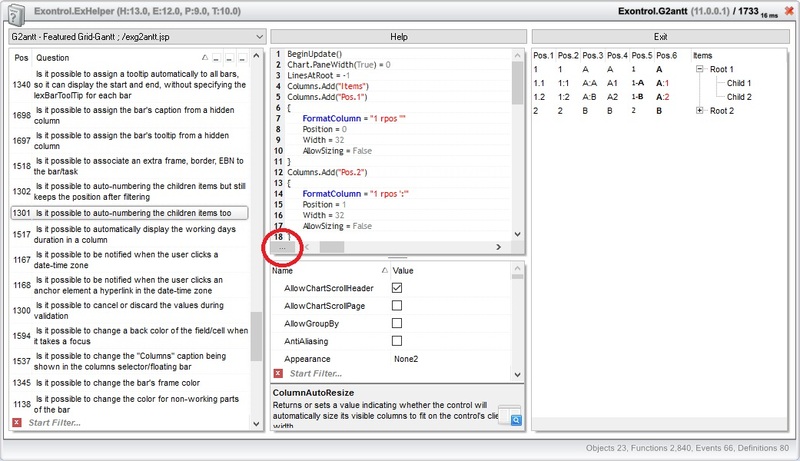 In the same time, the horizontal scroll bar in the middle part ( 5 ) includes the following buttons: X, VBA, VB6, VB7, VFP6, VFP9, C#, C++ and Delphi, like shown in the second picture. Click the VB6 and the x-script code gets converted to VB6. Click the VB7 and the x-script code is translated to VB.NET, and so on. The right panel, or the running panel shows the component after executing the x-script/template code. ALT + ENTER, runs the control in full-size mode ( the Questions, Template and Properties panels are hidden, while Running panel is showing at its maximum size ). ALT + Enter again restores the mode. ALT + Down, focuses the filter-bar prompt in the Questions panel. CTRL + rotate the mouse wheel, enlarges the font for the tool. CTRL + F, reopens the filter-bar prompt in the Questions panel. DOUBLE-CLICK the Title bar, to maximize the eXHelper tool. DOUBLE-RCLICK the Title bar, to minimize the eXHelper tool. DOUBLE-CLICK the Split bar, to get a new layout to arrange panels. If keeping CTRL, ALT or SHIFT while double-clicking the split bar the original layout is restored. The layout is saved when the tool is closed, and restored when it is opened. Minimize. Double Right Click the title of the tool, so the tool gets minimized, or select the Copy All Code from the Template's context menu. Filter by Selection. Double click a work in the Template view, so it gets selected, and right click the keyword, so the context menu shows up. Select the 'Filter For' command, and the questions are filtered by selected command. Filter by multiple columns. The first column displays the questions, and it looks for the word in the questions. The rest of the columns, holds keywords, and can be used to filter by keywords. Incremental search. Click the Question panel, and start typing the characters of the word you are looking for. As soon as you type, the selection is changed, and the word being selected is highlighted. Press the F3 key for the next occurrence. Run your own x-script code. Add your x-script code to Template view, and press the CTRL + S to save the template, and to re-run the template. Tooltip. Drag the cursor over a command in the Template view, and its documentation shows up, which describes the command, the object where it belongs, and its parameters. Reload. Click the Help button, while pressing the SHIFT key, so the Running panel displays a list of options you can select from. Click the 'automatically' or 'save' link, to refresh the list of questions for selected component. Latest. If the question you found is what your are looking for but don't see the expected result, make sure that you are running the latest version of the component! Drag the cursor over the bolded keyword, so its documentation shows up. If it doesn't the property or the method from the cursor is not implemented in your version, so you need to get the latest update. Scroll. Right click the bottom button of the vertical scroll bar in the Questions panel and so the latest questions are displayed. Full-Screen. Replace the "Layout=25;(1,2,3)/(10,(20/364;40),30)" in the CRD section of eXHelper.ini with "Layout=25;(3)/(30)", and you got displayed the running-panel in the exhelper. C:\Users\<USER>\AppData\Local\VirtualStore\Windows, where the <USER> should be replaced with your user name. One of required components is not installed. Install the eXHelper tool again. The component you selected for checking, is not installed, or requires a runtime license key. Download and install the component from the link as indicated, click the Help button or run the tool again. The component you selected doesn't provide any documentation. In the installer folder, you can locate several TXT files, which contains documentation for known components. For instance, the exontrol_calendar.txt file provides documentation for our Calendar control. We would appreciate any feedback that you want to share with us.